My father's friend visited our home the other day just to speak to me. His daughter is interested to pursue her Masters in Business Administration (MBA) in New Delhi. As I have studied Management from New Delhi, he wanted my opinion about the best MBA College in New Delhi. As soon as he asked me about the best MBA College in Delhi, I answered - Faculty of Management Studies (FMS) Delhi. I know this as my cousin had studied from there and also from my knowledge from newspapers and magazines. 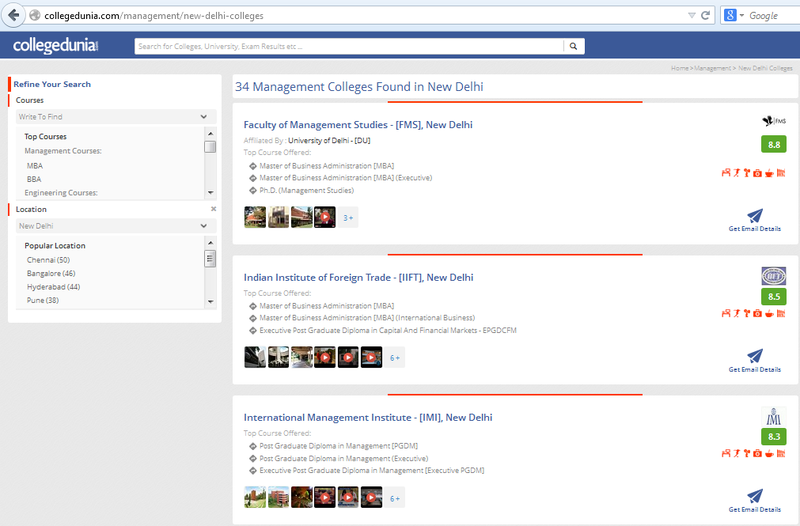 "Which are the Top MBA Colleges in New Delhi?" he asked. "Uncle, I have done my MBA more than a decade ago! We need to look for the latest information. These days, answers are available at the click of a mouse-button!" I logged on to the Collegedunia website. 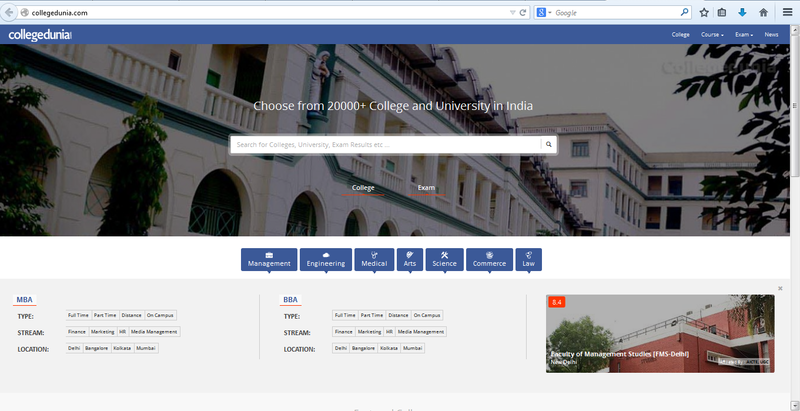 We can choose from 20000+ Colleges & Universities in India from this site. 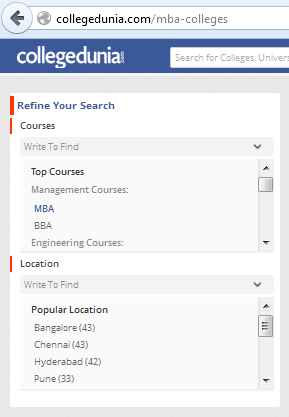 Clicking on MBA, we got a list - 817 MBA Colleges Found in India. But, we just wanted the names of the New Delhi MBA Colleges. There is an option to refine the search. We conveniently selected the Course & the Location. 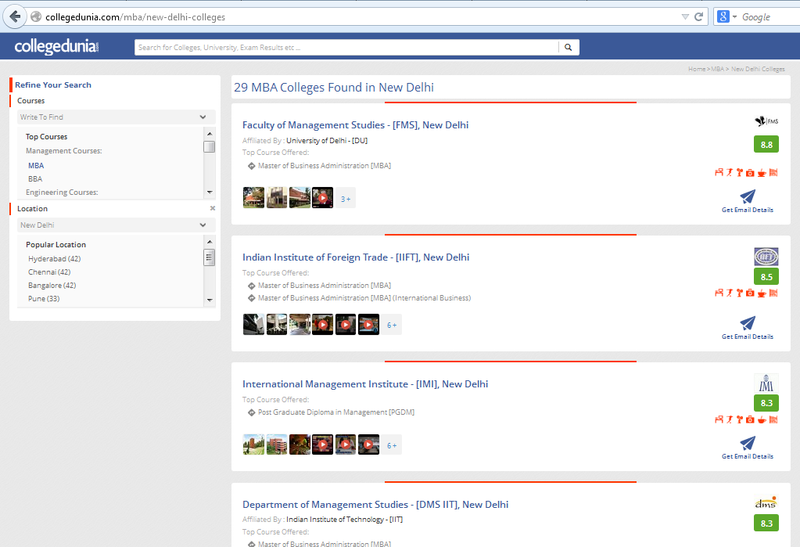 Selecting MBA & New Delhi immediately showed us the list - 29 MBA Colleges Found In Delhi. 34 Management Colleges Found in New Delhi. I showed Uncle that Faculty of Management Studies (FMS) is ranked as the top Management College in New Delhi. Collegedunia has also assigned a rating and gives info about the 'Top Course Offered' in each College in the list. Uncle found the information very helpful. Anita, you were a great help to your uncle. Isn't technology amazing? Even on my phone I can have instant information. Truly Linda. Technology makes info available for us in a jiffy. But, people also have to be smart and operate the smart-devices & know where to look for genuine info. Reached to your blog through your comment on renok adventures website !! FMS immediately grab my attention because I am from FMS 06....hope you trek with us someday !! So nice of you to share the information with your readers Anita! Very useful one! Yes, the MBA course does teach a lot. Thanks for sharing.